The Government Accountability Office issued two transportation-related reports in early November; one that called for “greater flexibility” in federal funding provided to the states for railroad grade crossing safety measures, with the other recommending that the U.S. Army Corps of Engineers develop a way to measure the cost of “deferred maintenance” for inland waterways so it can more efficiently use available funding for waterway construction needs. The GAO’s Nov. 8 report on railroad grade crossing safety programs recommended that the Federal Highway Administration re-evaluate its requirements to ensure states “flexibility” to address ongoing safety issues where roads and train tracks meet. The agency said crashes at highway-rail grade crossings are one of the leading causes of railroad-related deaths and, according to Federal Railroad Administration data, in 2017 there were more than 2,100 such crashes resulting in 273 fatalities. Since 2009 crashes have occurred at a “fairly constant rate,” the GAO noted, with the “persistence of crashes and deaths” raising questions about the effectiveness of the federal grade-crossing-safety program. 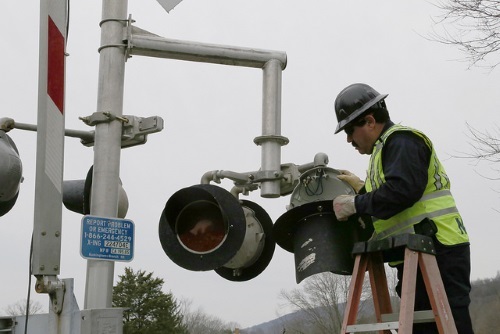 The agency said most state DOT officials and other relevant transportation officials use “local knowledge” of grade crossings to supplement the results of national models that rank grade crossings based on the risk of an accident. GAO spoke with officials in eight states who said they face “challenges” in pursuing certain types of projects that could further enhance safety, in part because of federal requirements. “While safety has improved, many crashes occur at grade crossings with gates and officials said there could be additional ways to focus program requirements to continue improving safety,” the agency noted in its report – which is all the more critical as FRA expects future crashes to grow, in part, due to the anticipated increase in rail and highway traffic. USDOT Secretary Elaine Chao expressed a similar point of view during a special summit on railroad grade crossing safety held by the FRA on Oct. 30. GAO’s inland waterways funding report, issued Nov. 7, examined how “persistent schedule delays and cost overruns” for inland-waterways construction projects prompted some in Congress to explore funding and management alternatives. According to the GAO, part of that problem involves the U.S. Army Corps of Engineers’ “inability” to define how much “deferred maintenance” exists for inland waterways – a problem that exists in part because there is no agreed upon definition for deferred maintenance. The GAO also determined in its report that the current “incremental-funding approach” for prioritized inland waterway projects, among other things, has resulted in schedule delays and cost increases. “Although full upfront funding for capital projects is an important tool for effective management, inland-waterways construction projects have been funded incrementally, meaning the Corps requests – and Congress appropriates – annual funding that covers only a portion of a project’s estimated costs,” the GAO said.